Just south of The Bridge, the Logan Square branch crossed over the Lake Street 'L'. You&apos;ve probably seen it if you travel around the near West Side. It looks like something from a giant’s Erector Set. An iron bridge crosses over the West Side Metra tracks a block west of Ashland Avenue. The bridge isn’t connected to anything else. Perhaps the giant plopped it down, got bored, and wandered away. The bridge is actually a remnant of the "L." It was built in 1895 by the Metropolitan West Side Elevated Railroad Company, as part of the company’s Logan Square branch. The Met&apos;s terminal was on Franklin near Quincy. Trains ran west to just past Ashland, then hung a right to go north along Paulina, over the bridge, and up to Milwaukee Avenue. Then a soft left turn along Milwaukee, northwest to the terminal at Logan Square. Obviously, this wasn’t a very direct route. In 1938 the city began digging a subway straight out Milwaukee Avenue. World War II delayed the project, but it was finally completed in 1951. The new subway made the "L" along Paulina redundant. For some reason — probably money — CTA didn’t get around to tearing down the unused "L" structure until 1964. The bridge over the railroad was kept in place because dismantling it would disrupt the train service crossing under it. 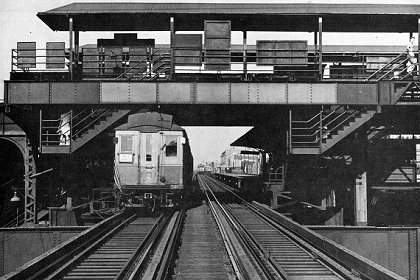 To recap — Chicago’s Bridge to Nowhere carried trains for about 56 years. It has been standing idle now for over 60. A few years ago CTA floated the idea of building a new rapid transit route called the Silver Line. The service would run in a semi-circle about two miles out from downtown, connecting all the existing lines. If the Silver Line ever does become reality, then our lonesome bridge might be put back in use.